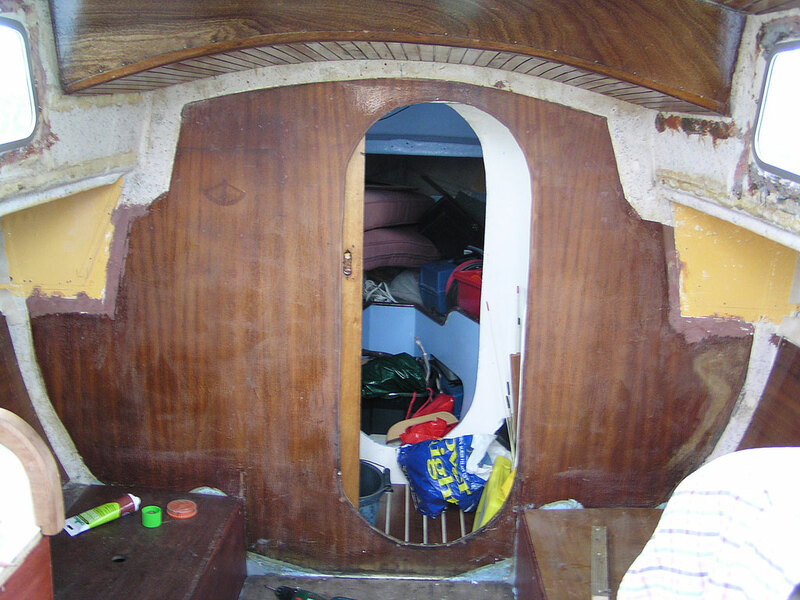 The main saloon bulkhead had 32 holes in it and some deep gouges. We tried filling and rubbing down but in the end gave up and Evostuck some vinyl material to it. Wood is nice. 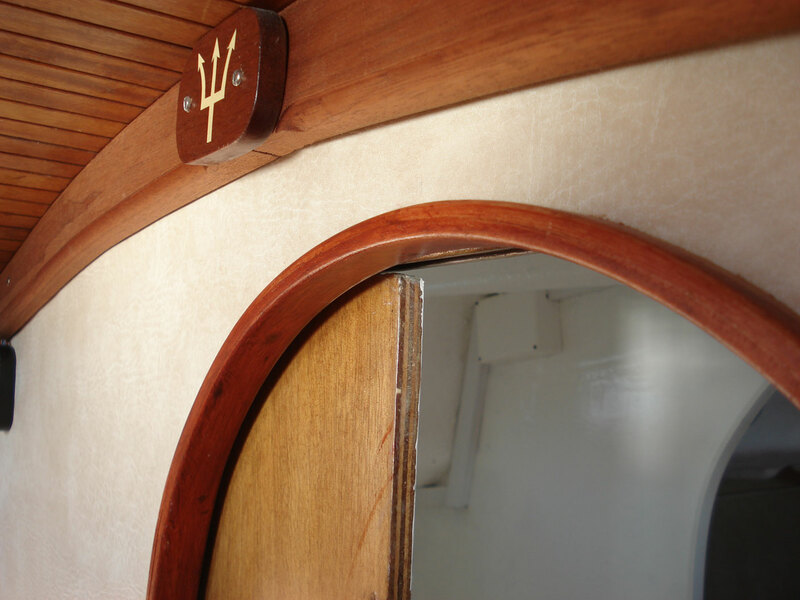 But the sapele mahogany finish did help make the cabin very dark. 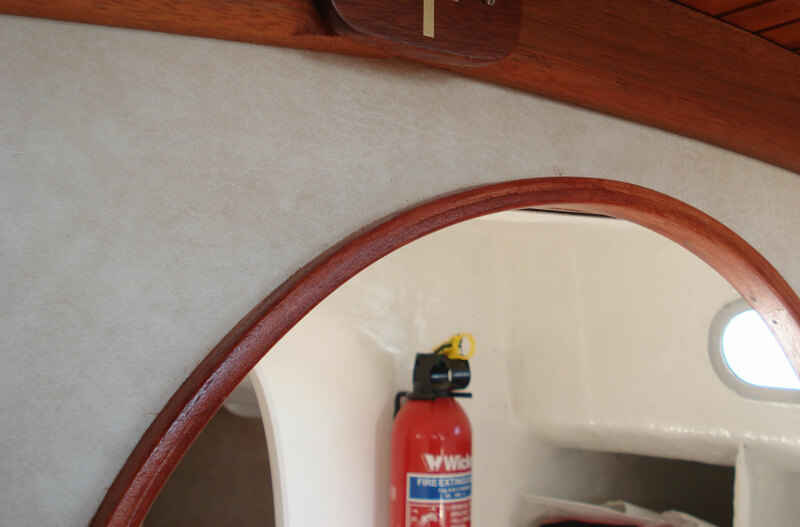 The bulkhead vinyl was installed before the lockers and hull lining so it was neatly finished round the edges. But it needed to be finished off at the roof – where the existing teak slats appear to be permanently attached, and round the oval doorway. To finish off the vinyl round the door aperture we laminated a curved hardwood moulding to create a rebated door liner. We did this in a way which did not require a great deal of cabinet-making skill. Further details on this can be found below. A curved cover board here cut out of a single piece of wood would mean starting with a hardwood plank 6 inches or more wide and six foot long. A cover board in two sections joined in the middle can be cut out of shorter (and cheaper) plank. Hence the Trident badge in the middle of the bulkhead covering the joint. 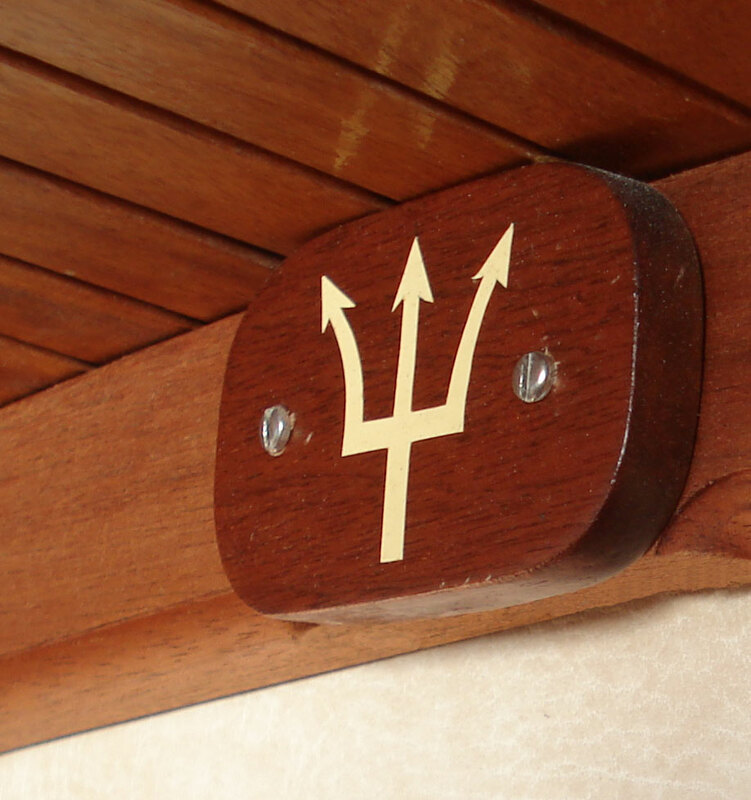 The “inlaid brass” Trident insignia is in fact the sort of sticky vinyl used to make boat name lettering. The gold-coloured shape was cut out with a craft knife, stuck to the wooden plaque and varnished over. 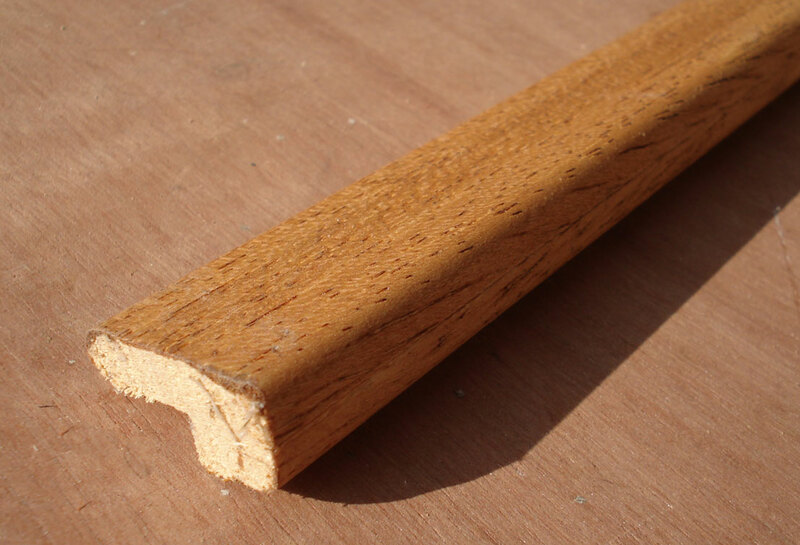 For this three 2.1m lengths of shallow D-shaped hardwood moulding (about 25mmx8mm) were used. One of these lengths was split down the middle. 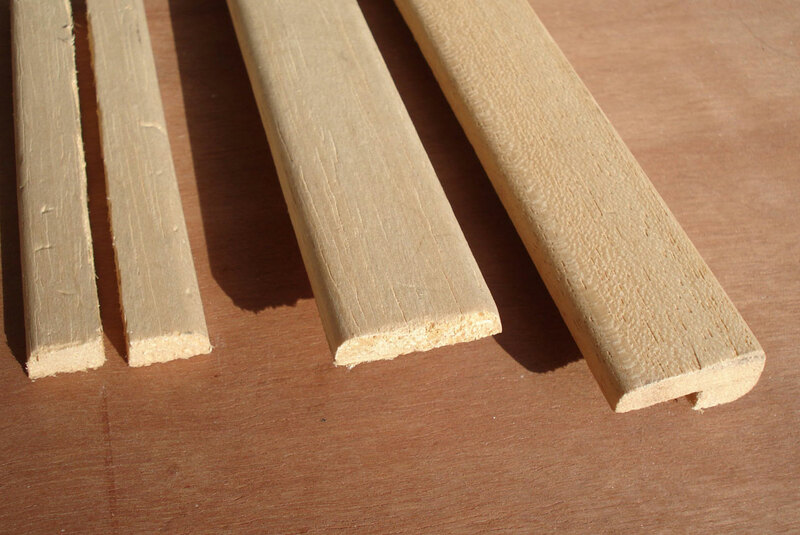 Each of these split lengths was then glued to one of the other two lengths to make a a pair of stepped mouldings (see picture left). The glueing was carried out in a jig after steaming and bending the strips to produce a pair of laminated curves. Using scrap half-inch chipboard, a bending jig was made by copying the curve in the doorway (it was not a very smooth curve or equal at top and bottom so each arc in the doorway was first made smooth and similar). The jig was covered in polythene film to stop glue sticking to it. A steamer to make the strips of wood pliable was made using an old electric wallpaper stripper tank with the steam tube stuck in the end of a 3m length of 45mm plastic drain pipe. The wood strips were steamed in this one piece at a time but it maybe that you can steam more than one piece together. Care is needed to ensure the water heater does not boil dry. The wood is quite thin and light so only took about 15 minutes to become pliable in the steamer pipe. When the first whole section was pliable, it was it was bent in the centre and placed in the curve of the U-shaped former with the D of the moulding on the inside of the curve. This was held in place and shape by sliding in the section of chipboard cut out to form the jig. This left half the strip sticking up proud of the mould. One of the split halfs of the moulding was then steamed, bent and glued to the bit of the moulding already in the jig and standing proud of it. This addition was wedged in place using the blocks provided on the jig. You need lots of these blocks and wedges – more than shown. Then the whole thing is left for the glue to cure. 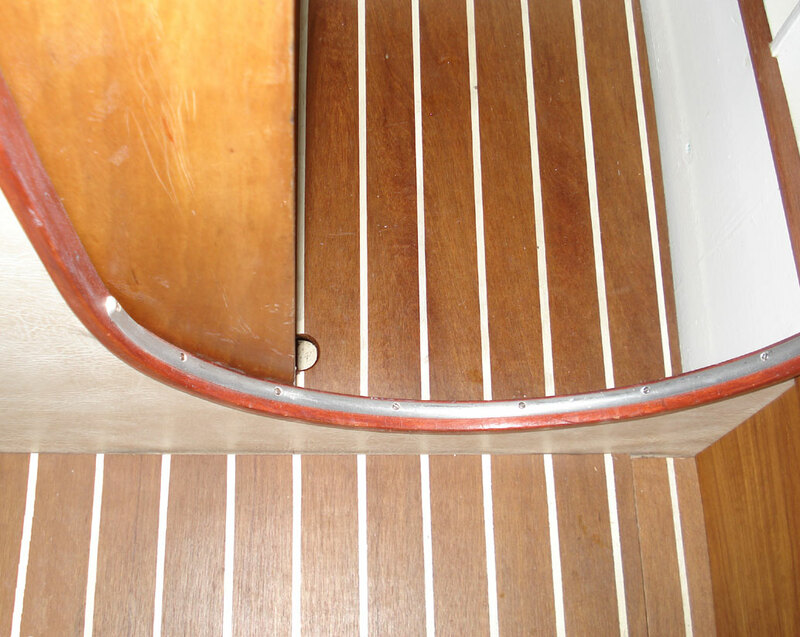 When it has, the resulting stepped moulding retains the curve when it is removed from the jig, and provides the necessary rebate to cover the edges of the bulkhead and vinyl. The moulding was then stained to match the rest of the wood in the cabin. 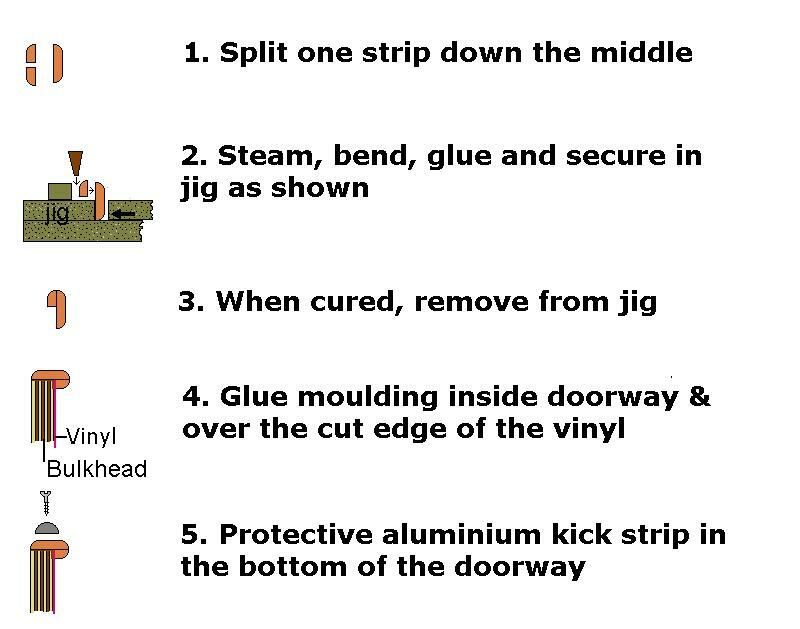 You do all this twice to make two preformed curved mouldings – one for the top curve of the door and one for the bottom. 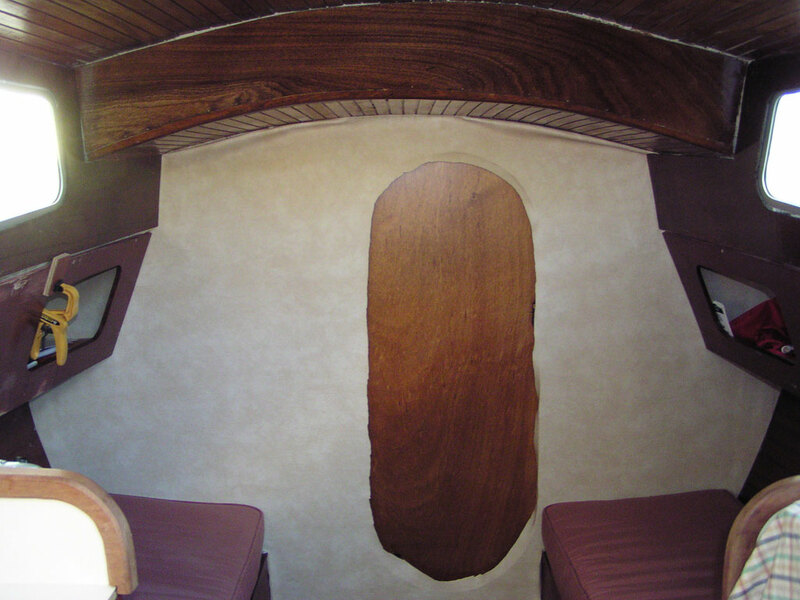 Then it was just a matter of trimming and glueing the two mouldings into the doorway aperture in the bulkhead and staining them up to match the rest of the saloon woodwork. A curved a piece of aluminium half-round was screwed at the bottom of the doorway to protect the moulding where it might get stepped on. Brass would have matched the door handle recess but I couldn’t find any brass d-shaped strip at the time. The picture also shows the state of the floor after five years use. The door is the original awaiting replacement with a teakfaced one.